Immunogen: Synthetic peptide corresponding to the sequence near the N-terminus of mouse adrenergic receptor α2a. Crossreactivity: Predicted species reactivity based on epitope sequence homology: chimpanzee, rhesus macaque, dog, wild boar, bovine, cat, treeshrew, rabbit, platypus. Predicted MW of ~49kDa. Higher MW species (~ 75kDa) also observed by Western blot which may reflect post-translational modification or dimerization of the receptor. Scientific Background: Adrenergic receptors mediate the hormone and neurotransmitter functions of adrenaline and noradrenaline. Adrenoreceptors function in peripheral tissues and the central nervous system to regulate numerous vascular, metabolic, and neurological functions, and are the target for many therapeutically relevant drugs including those for the treatment of hypertension, asthma, benign prostatic hypertrophy, and depression. Adrenoreceptors are classified by three types and multiple subclasses (alpha1A,1B,1D; alpha2A,2B,2C; and beta1,2,3) based on pharmacological and molecular characteristics. Western blot analysis: MW marker (1) and 10µg rat brain extract (2) probed with Adrenergic Receptor (α2a) pAb at 3.0µg/ml. 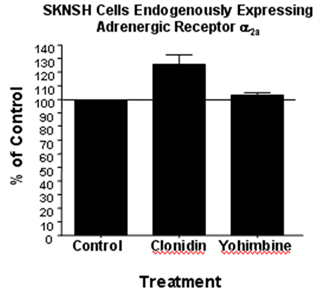 Cellular ELISA: SKNSH cells endogenously expressing Adrenergic Receptor 2a were treated with indicated concentrations of agonist (Clondin) and antagonist (Yohimbine) and probed with Adrenergic Receptor (α2a) pAb (1:1000 of a stock solution of 1µg/μl) by ELISA. Data from vehicle treated cells were taken as 100%. Results are the mean ± SEM (n=3). 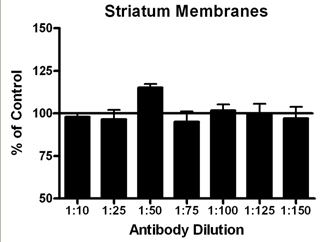 Membrane ELISA: Lewis rat striatum membranes (5µg/well) were treated with 1 μM concentrations of agonist (UK14304) and probed with Adrenergic Receptor (α2a) pAb (1:10 to 1:150 of a 0.1µg/μl stock solution) by ELISA. Data from vehicle treated cells were taken as 100%. Results are the mean ± SEM (n=6).